On FIPS 201 compliant sites, Goverlan Reach Remote Control allows users to supply smart card credentials to authenticate on remote systems. In order to redirect a local smart card to a remote machine, the Goverlan Smart Card Reader Driver must be installed on a remote computer. Goverlan Reach RC automatically detects any local smart card readers on the operator’s system and automatically prompts you to enable Smart Card redirection. Once this detection is complete Goverlan will ask the operator to select the local smart card reader to redirect. Use the Goverlan Settings screen to set one of the following options for Smart Card Redirection prompting. Automatically redirect my smart card reader– This setting will automatically redirect the smart card reader with no prompt. Prompt me to redirect if a reader is detected– This setting will prompt the Goverlan operator to choose which local reader to redirect. 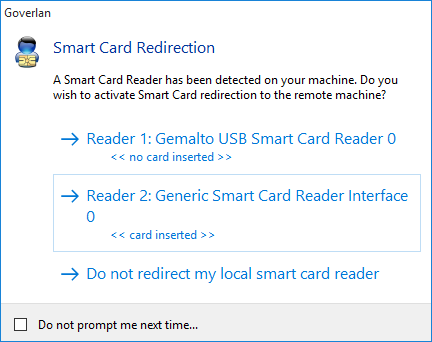 Disable Smart Card Redirection– This setting will suppress any Smart Card redirection prompts. The Activity Indicator will be displayed once redirection is active. The activity indicator will flash when smart card data is being transferred between the remote system and Goverlan Reach RC. Click the Activity Indicator to reveal the Smart Card Reinsert control. Selecting this will initiate a smart card reinsert command on the remote system.